So I've been into a sewing mode lately perhaps this is because I've been working on my yoga bag and tend to get distracted or bored with the project at hand and move onto something else. 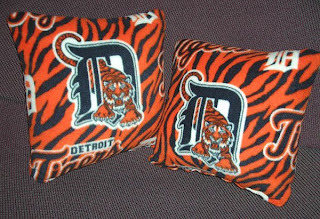 Thus the completion of a couple new projects: Katie's Northwestern Sweatshirt Pillow and 2 Detroit Tigers Pillows. 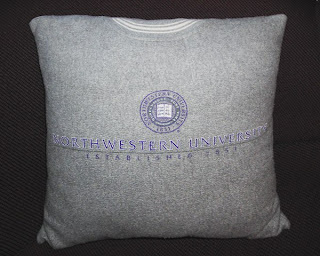 I'm quite pleased with the end result of both projects and even did a way too long and extremely boring video of the transformation of Katie's sweatshirt into a pillow which can be found on my YouTube channel. It was kind of fun to do the project and considering that the Irunlikeagirl site wanted a starting price of $50 I think Katie got off pretty cheap for $20 considering she also got one of the Tiger pillows. Well, it's not like I'm in this for the money anyway... thank goodness. Here's the link for the Playlist and here are the YouTube videos.